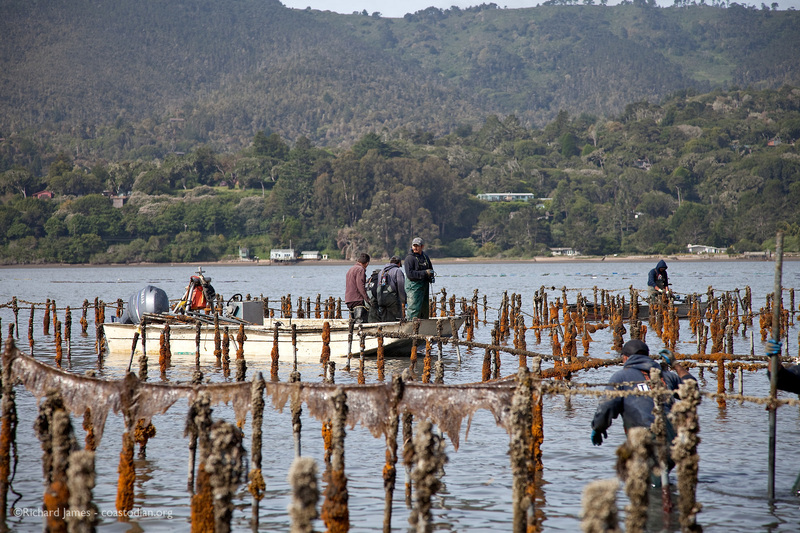 A public meeting to discuss oyster farming’s impact on Tomales Bay happened! 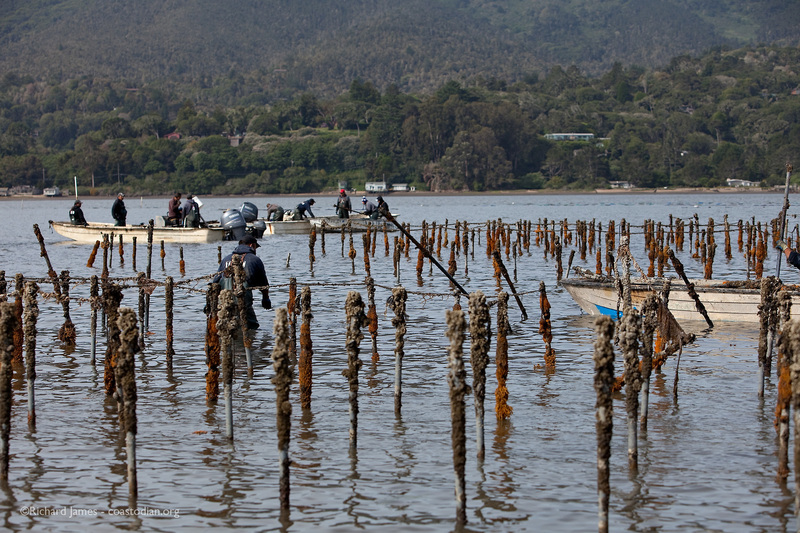 On Thursday 6 August at the Marconi Conference Center in Marshall CA, perhaps thirty people representing many perspectives on oyster farming in Tomales Bay gathered and talked in a civil forum about the debris left by oyster farming in and around Tomales bay over the past 80 years. Sonke Mastrup, Executive Director of the FGC set the ground rules for the meeting. 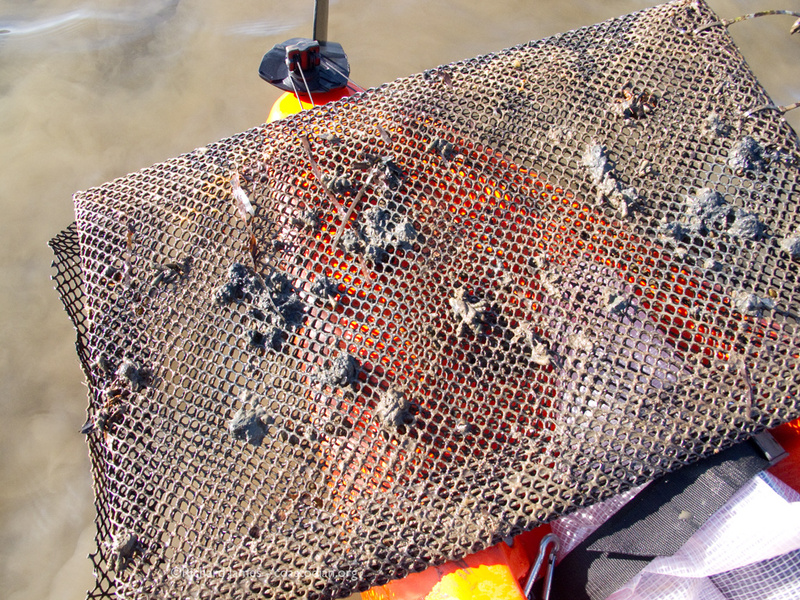 I gave a presentation explaining what I’ve been finding in the bay and along the shore over the past 2+ years which you can watch below. 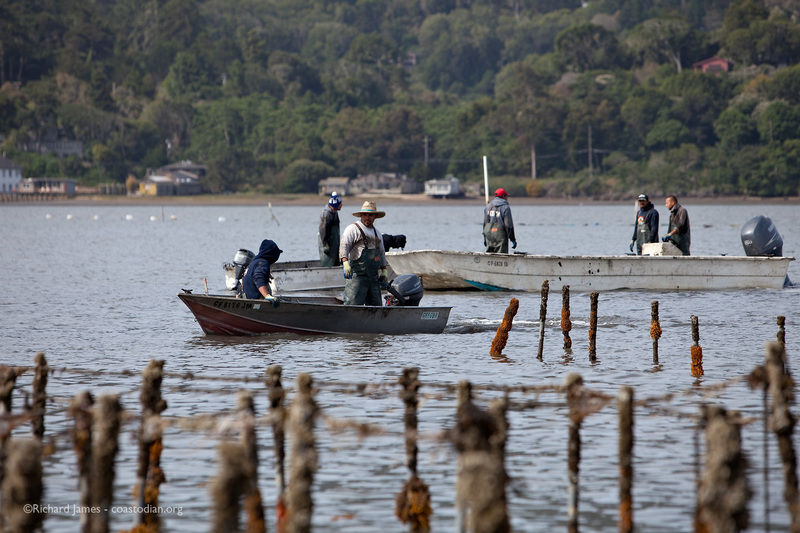 Many agencies have a say over what happens in Tomales Bay. Clearly, not all agencies exercise their voice. 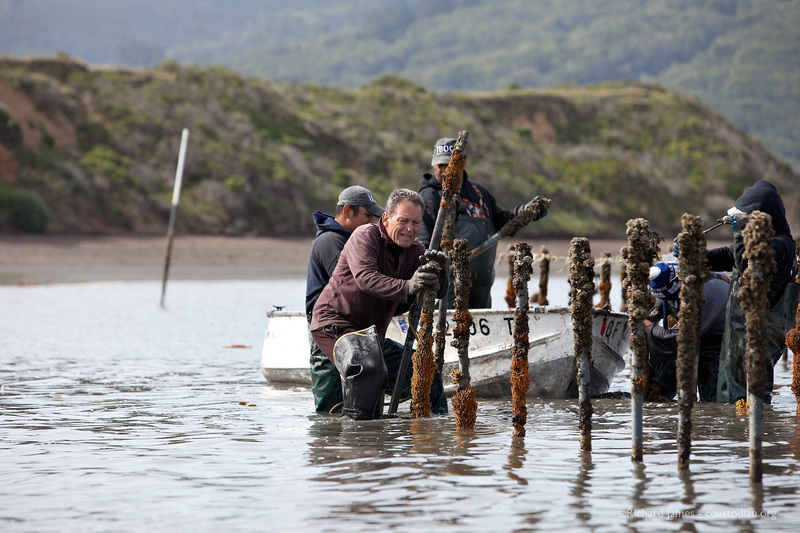 Some growers would like to see the people from the FGC and CDFW come visit Tomales Bay and perform their oversight duties more often and on a regular basis. Something that has NOT been happening for some time, if ever. 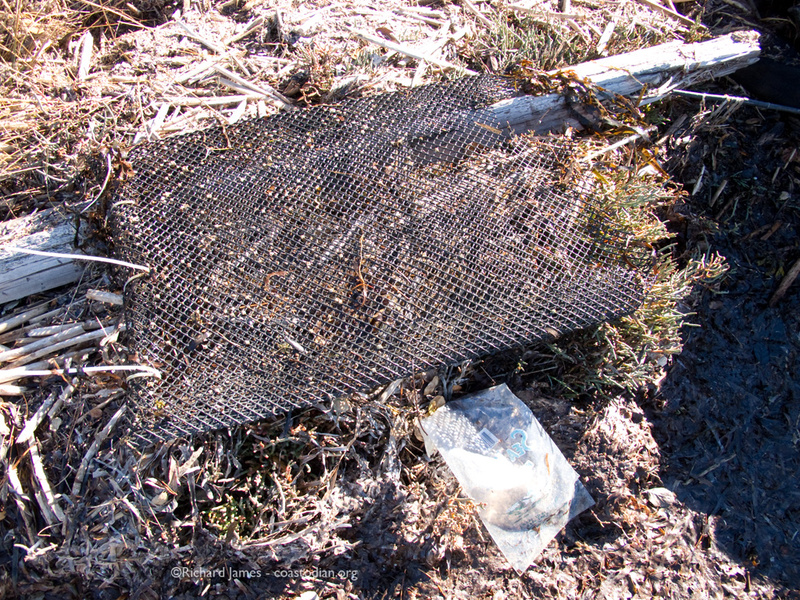 Sonke Mastrup (FGC Executive Director) pointed out that littering is against the law. 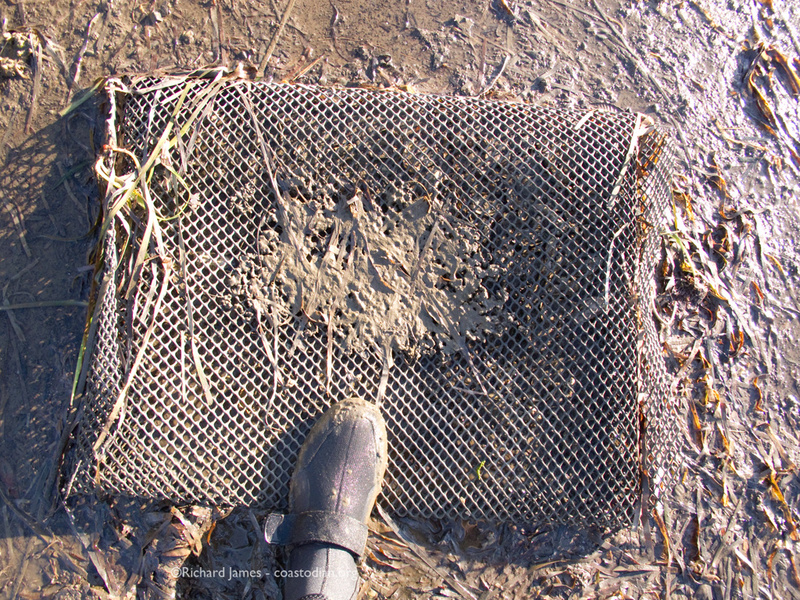 This was in response to questions about what laws are on the books to explicitly prohibit the growers from leaving the messes they have been leaving for a long time. 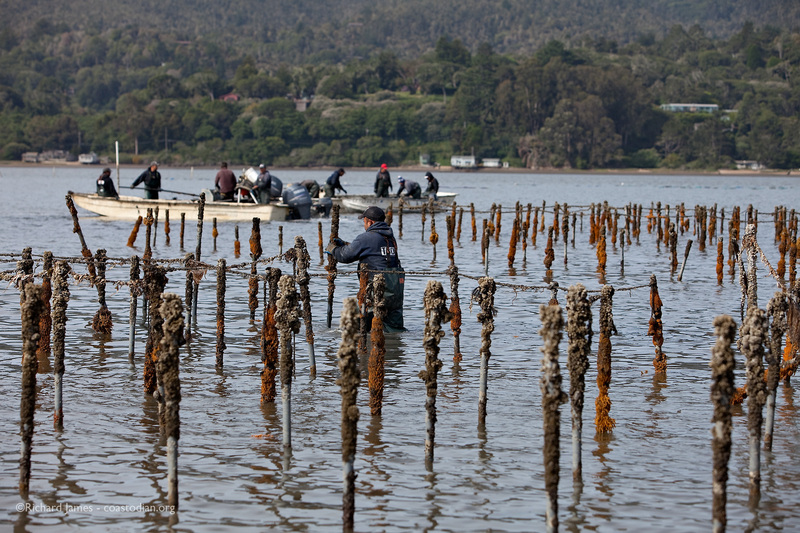 At this time, I am offering a bounty of 2 dozen fresh oysters [small or medium] to the first person that can show me proof positive of a Tomales Bay oyster grower being cited for littering in the last 10 years. I’ve heard Sonke state that littering is against the law in Marshall at this meeting, and back in April at the FGC meeting in Santa Rosa. 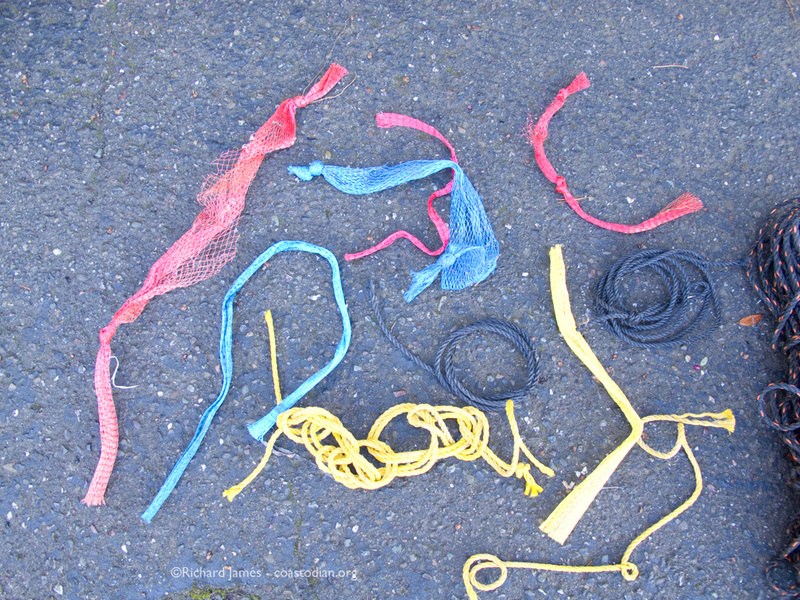 Over the past two+ years of picking up the mess left by Tomales Bay growers, I’ve packed out several hundred pounds of grow-out bags, thousands of zip-ties, hundreds of yards of rope and rope scraps, plastic foam, PVC pipes, shards of PVC pipes, retail oyster bags, remnants of retail oyster bags, gloves, tools, parts of tools, lumber and myriad other items left by growers in Tomales Bay. 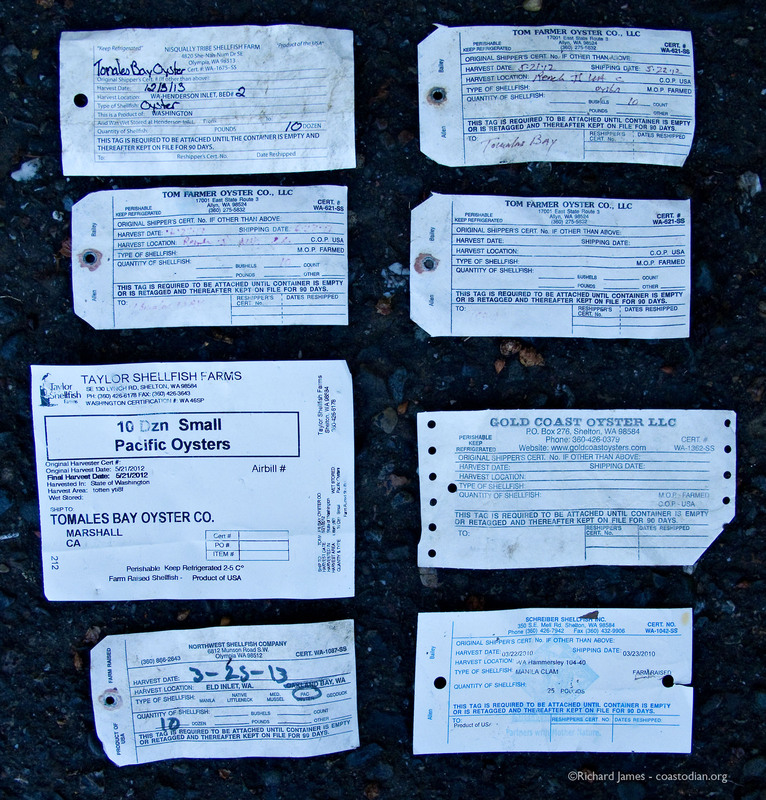 Not once have I seen a CDFW game warden, or any other “landlord” of state lands on patrol. 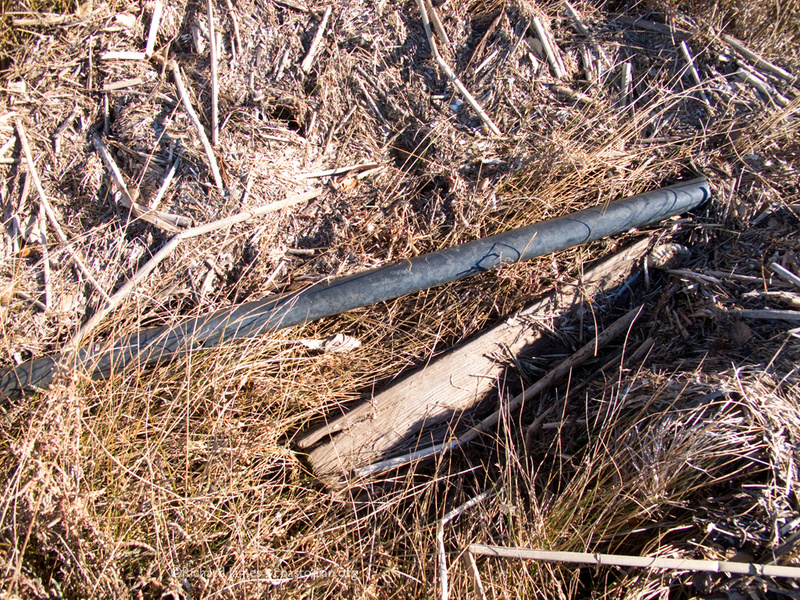 A list of loopholes in the leases signed by the growers “renters” and fish & game commission “landlord” was presented. 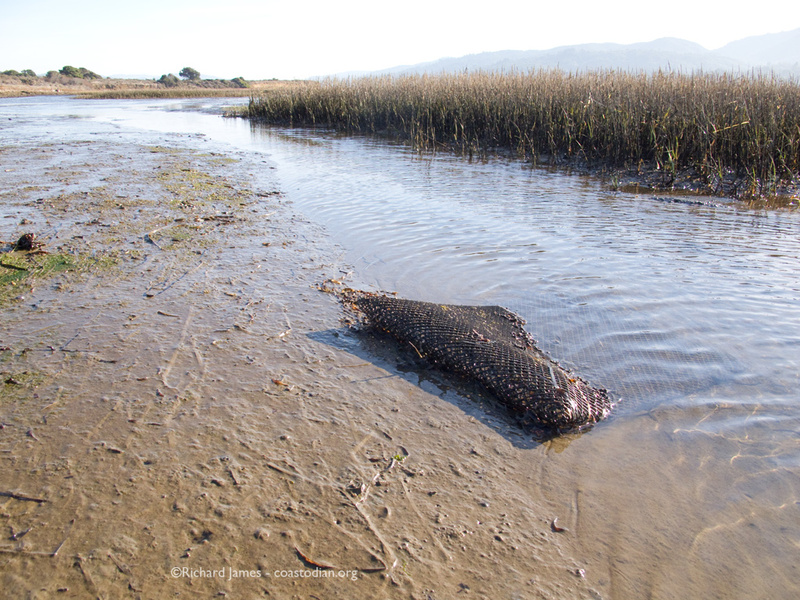 If you care about Tomales Bay and would like to see the agency tasked with protecting your planet from activities the same agency promotes, please write the Executive Director of the Fish & Game Commission and tell him. Next related post may be found here. Previous related post may be found here. 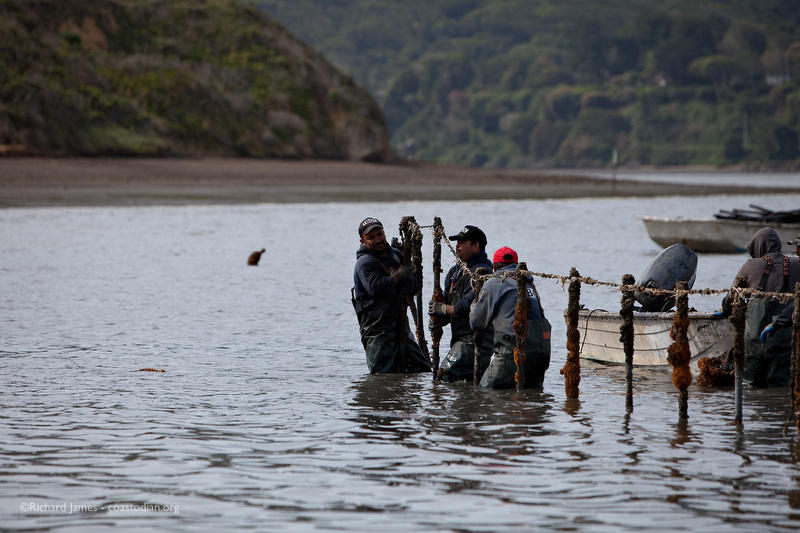 See the first post in this series “Save our Tomales Bay” here. 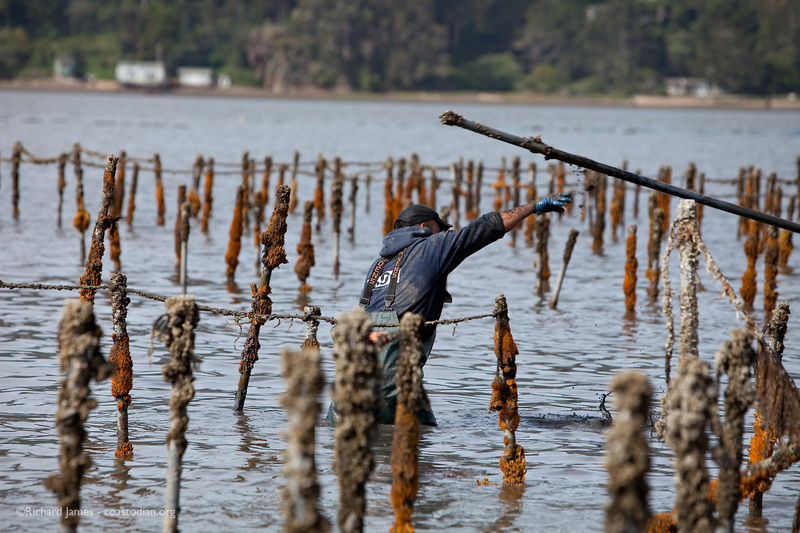 Click on the words above “Save our Tomales Bay – part 17, TBOC gets after it in a big way” to see this entire post. 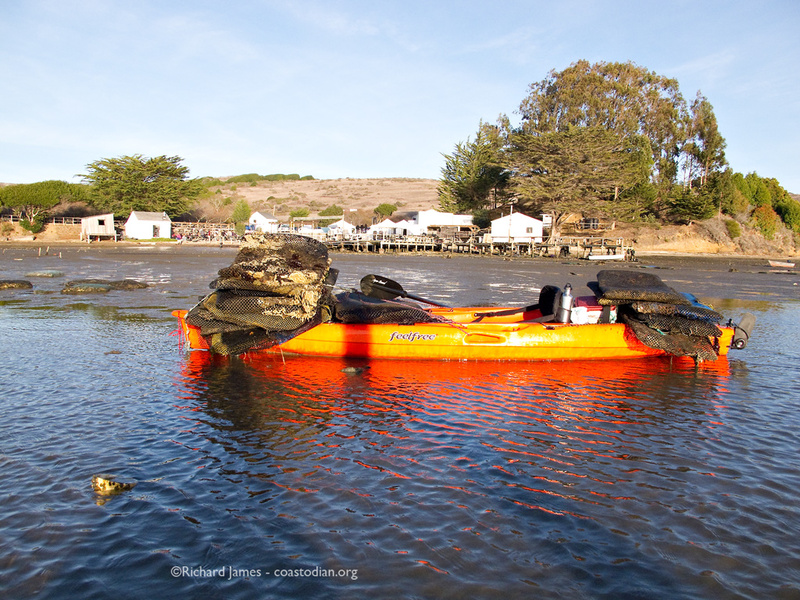 As you may have noticed if you’ve been keeping up with the Series “Save our Tomales Bay…”, I have a big problem with people that trash the planet. Same goes for companies that those people often hide behind in the courts. 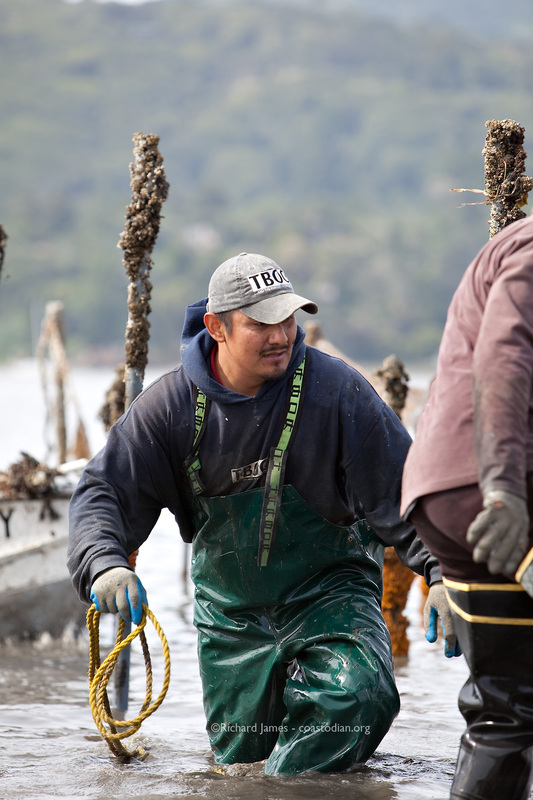 Apparently Todd and his crew at Tomales Bay Oyster Company do too! 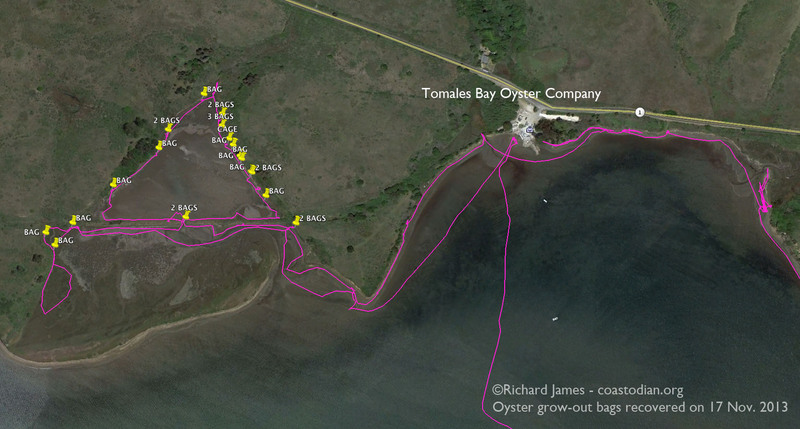 The images below, recorded on 16 May, show the latest of a few big days where the TBOC staff made time to pick up the mess left behind by a previous oyster farmer whose lease they purchased. 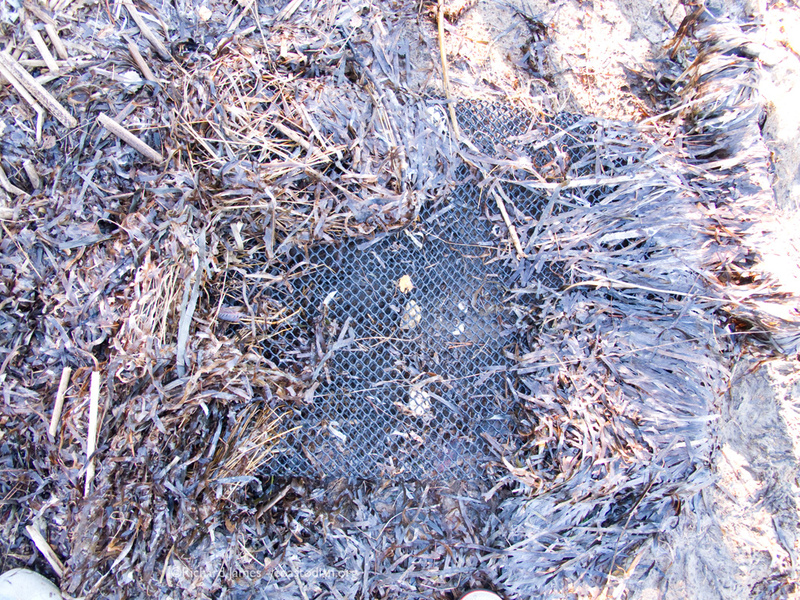 Todd tells me he has removed over 3000 of the PVC pipes you see in the images. He likely has several thousand more to go. He tells me he plans to remove those soon. And I believe him. 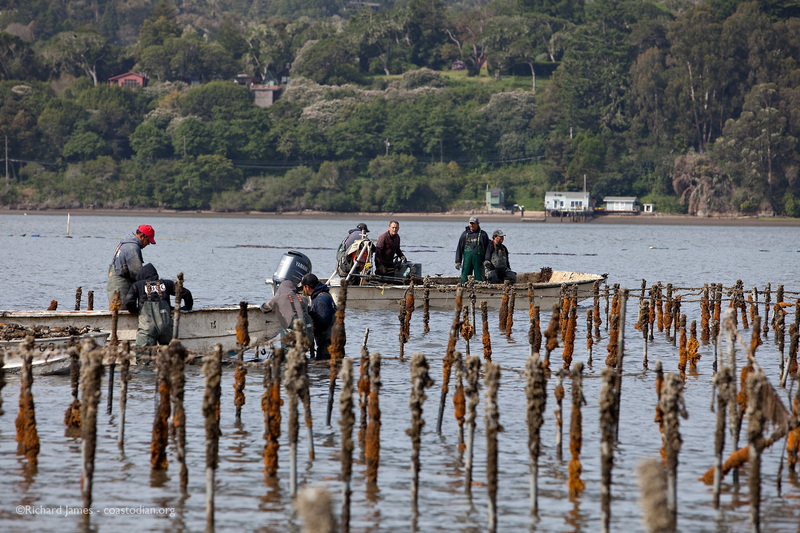 Kudos to the TBOC crew for their efforts at being a good steward of the very bay they depend upon for their livelihood. 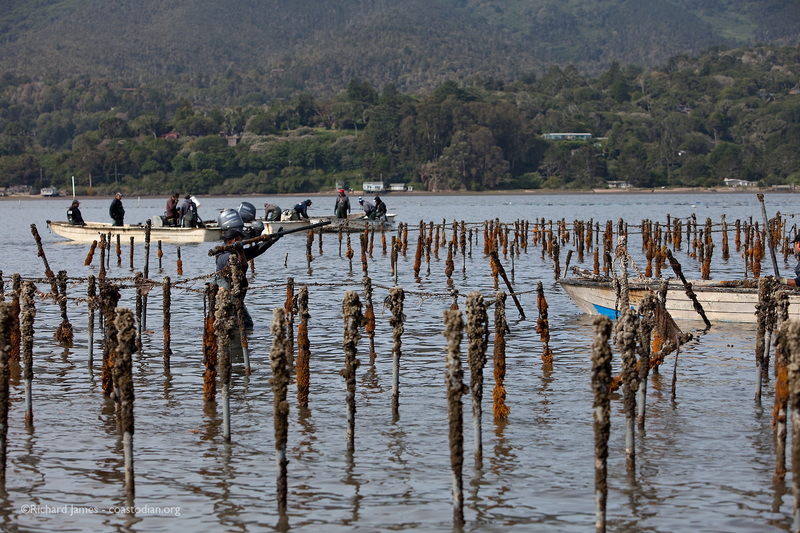 The same bay that hundreds, perhaps thousands of species called home long before humans decided to complicate matters with all our trash. 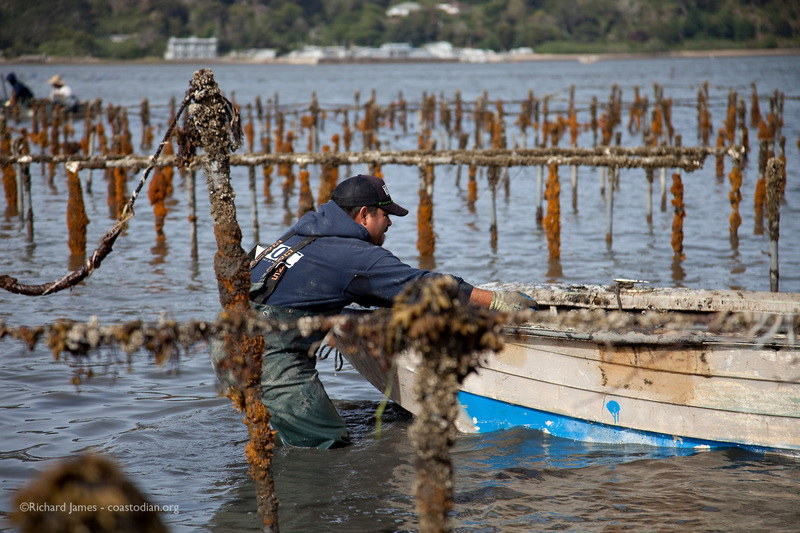 Oyster farmers in California pay into an escrow account when they lease an area. 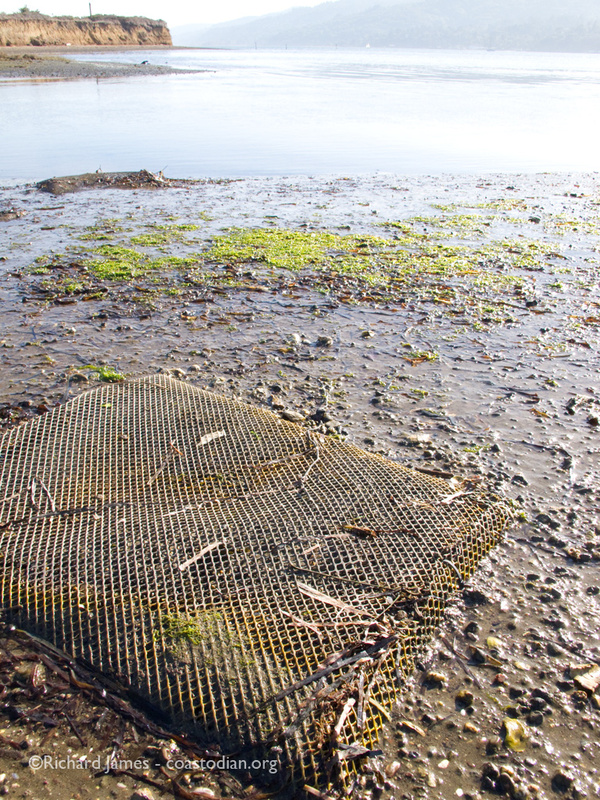 Those funds were designed to be used to pay for cleanup under certain conditions. The problem as I see it is, that fund is inaccessible due to complicated rules. 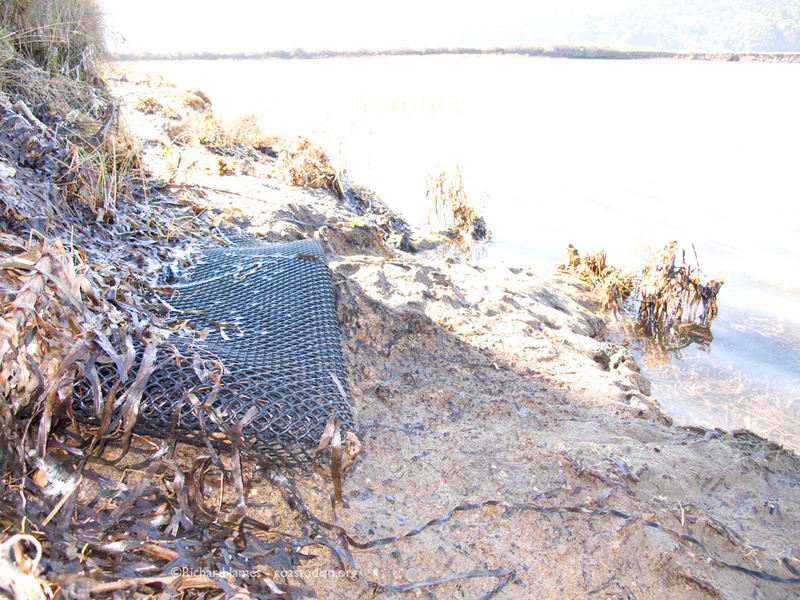 So, the cleanup that should be taking place, especially when leases change hands, never happens. 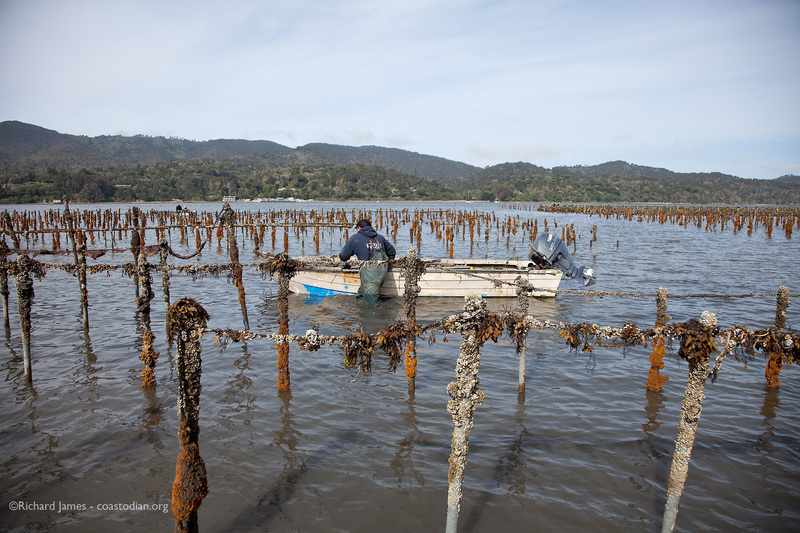 Witness the messes we see in Tomlaes Bay, Drakes Estero and all along the Marin coast, thanks to Johnson’s oysters [now Drakes Bay Oyster Company]. 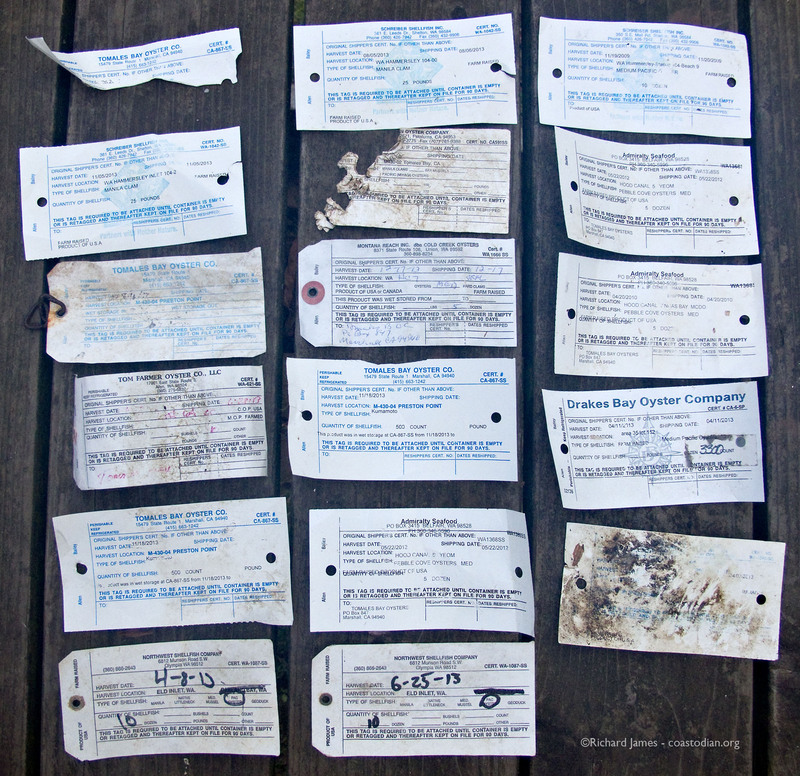 I plan to work with the Fish & Wildlife Commission to change the language in the lease agreement so that no more of these messes get left behind. More on that later. 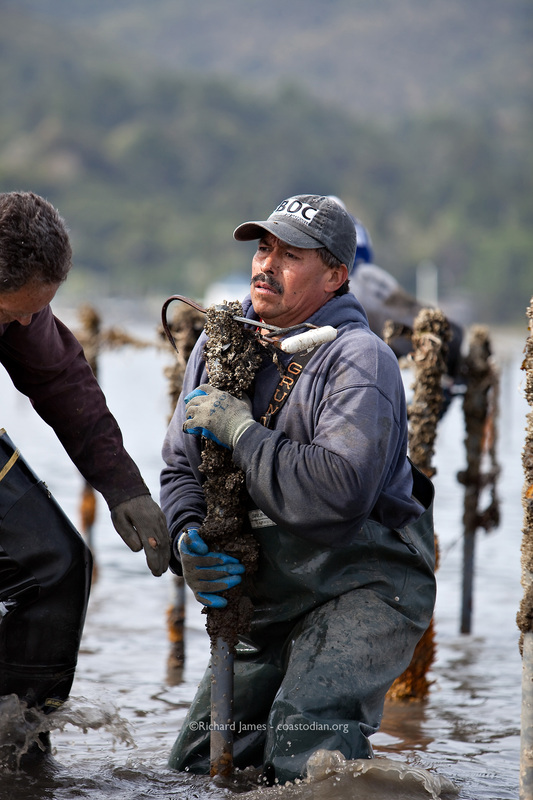 If the people pushing the California Shellfish Initiative want to expand oyster farming up and down the coast of California, they best get on board with lease agreements that have teeth, stopping all the finger pointing between present and past lease owners over who made the mess. 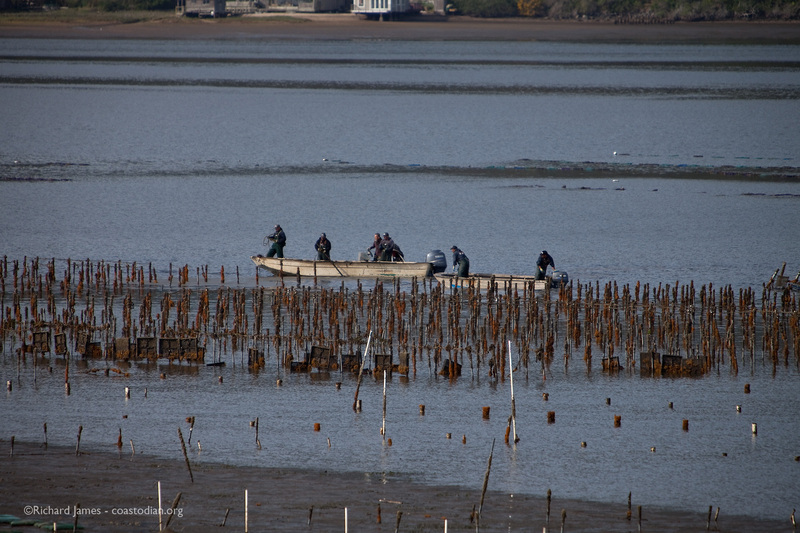 Better yet, define best practices for all oyster farmers such that the mess does NOT get made in the first place. 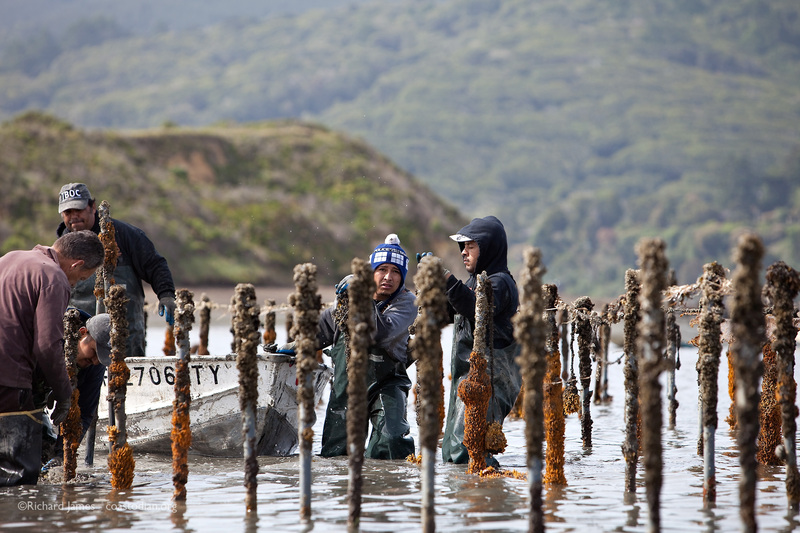 Anyone that wants a copy of the current lease agreement in use, and is willing to help modify the language to ensure a clean California coast, send me a note and I’ll send you a copy. As always, click on an image to see a much larger version. 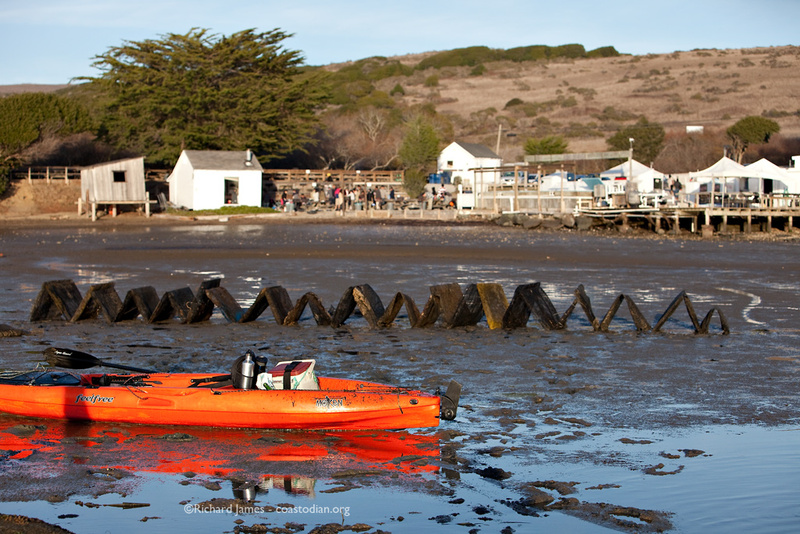 Click on the words above “Save our Tomales Bay…” to see this post as it was meant to be seen. 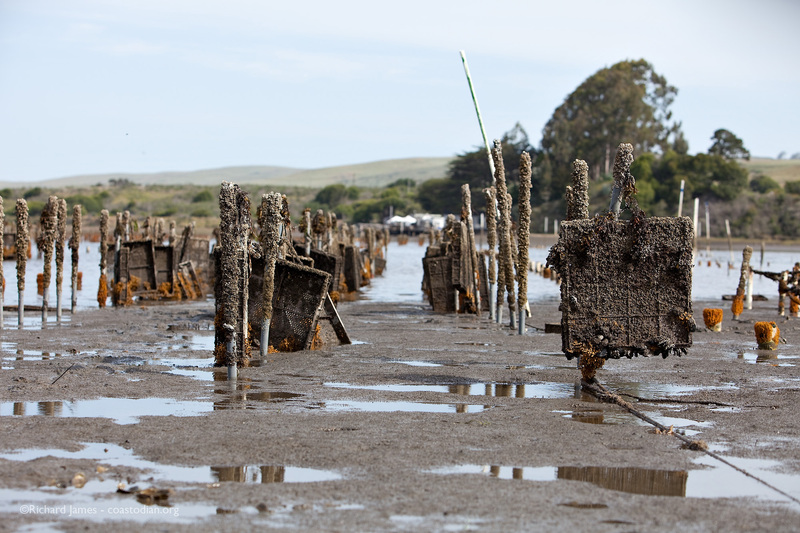 It appears I was premature in doling out kudos to the folks at Tomales Bay Oyster Company (TBOC) for picking up after themselves. 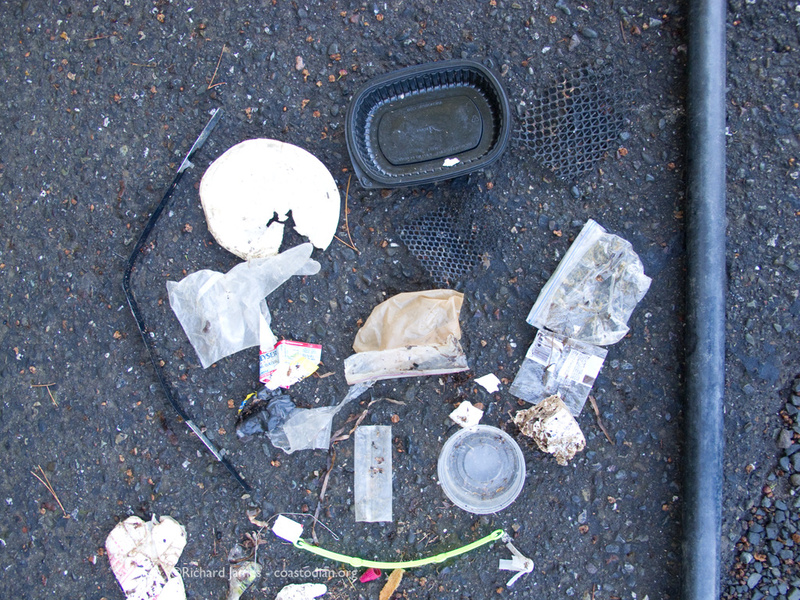 The garbage continues to show up on the stretch of shore just south of their retail operation. 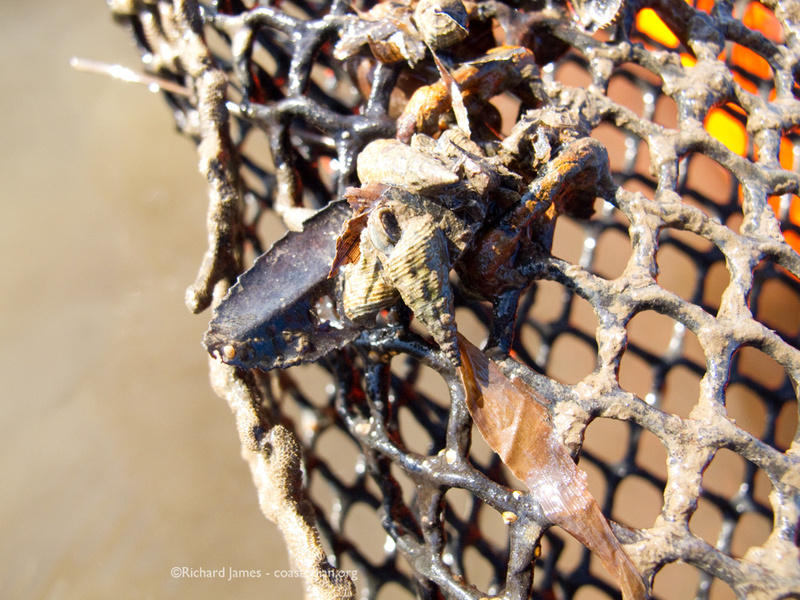 I continue to be flummoxed at how a business dependent on nature for profits can be so cavalier in the care of that same environment from whence the bivalve bucks become. 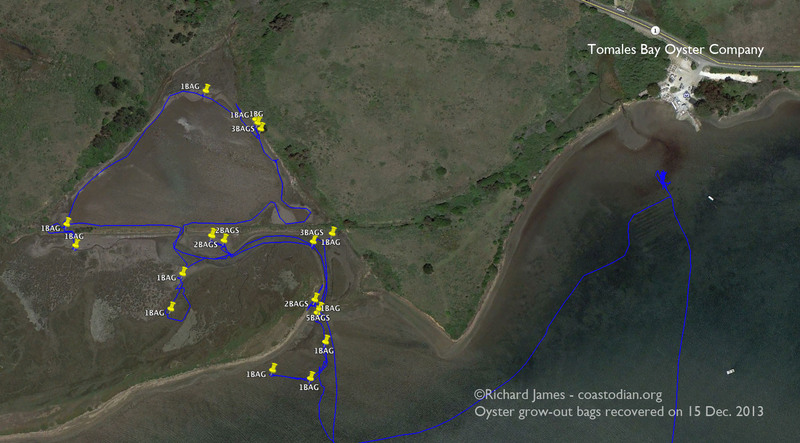 With these maps I hope to be better able to figure out the source of the garbage in Tomales Bay. 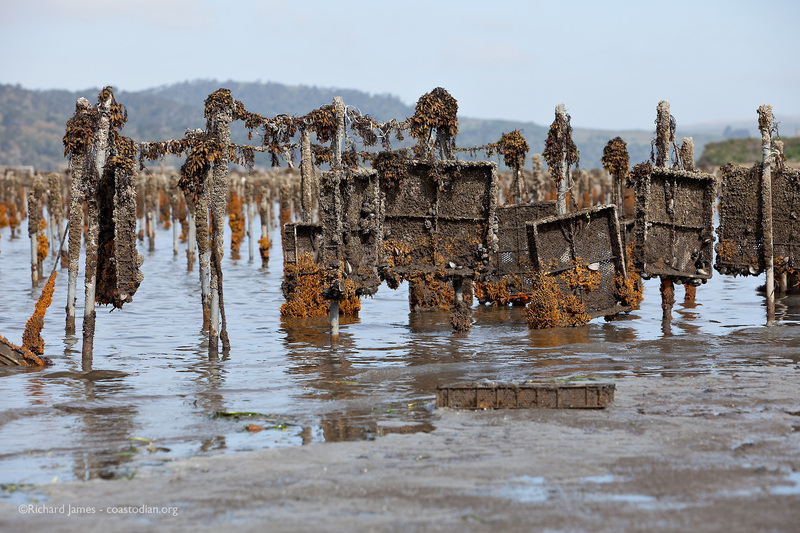 I’ve been justly heaping the shame on Tomales Bay Oyster Company for producing the mess I find in the southern end of Tomales Bay. 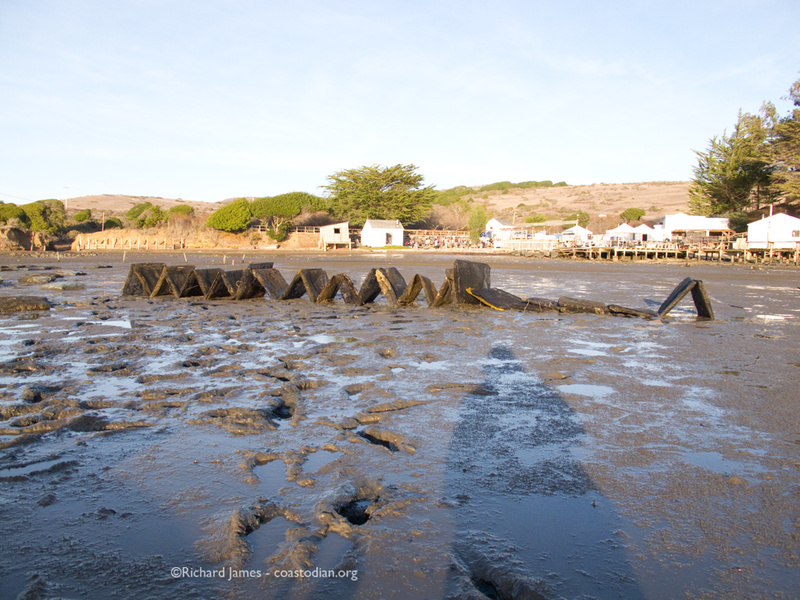 I say justly because the state of the shore I walk reflects the state of the production area and the mudflats directly in front of the operation in The Bay. In a word, deplorable, describes how it looks. 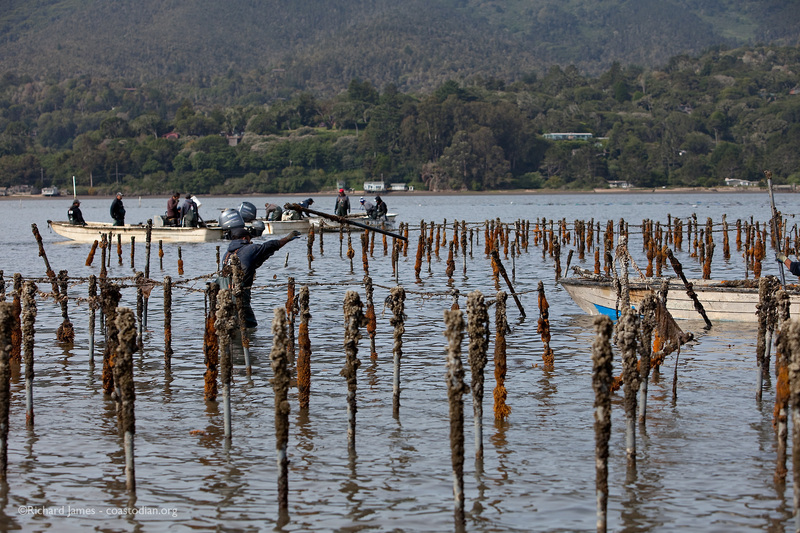 Armed with these new maps, I see that there are three other Oyster farmers with leases in the southern bay region, Hog Island Oyster Company, Point Reyes Oyster Company and Marin Oyster Company. In light of this, I’ll be sure to share the responsibility of the continuous mess I find equitably. 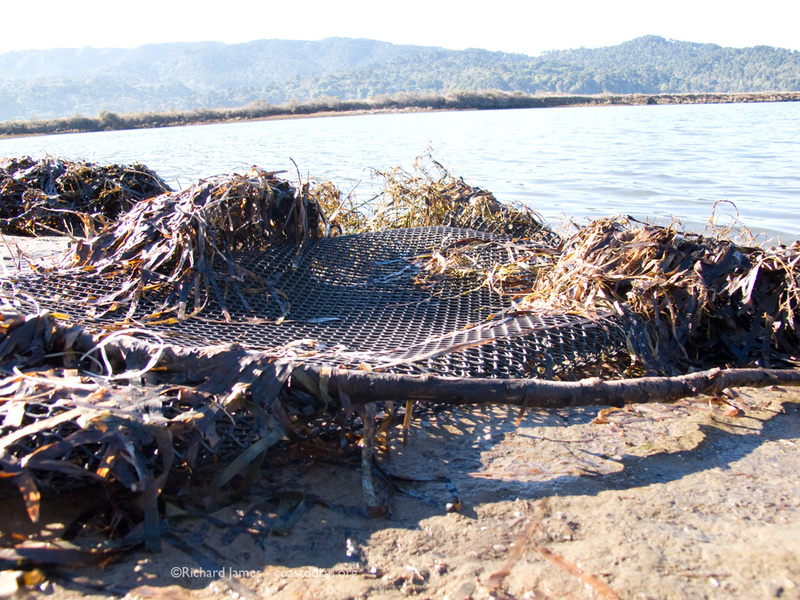 The folks at Hog Island contacted me recently. 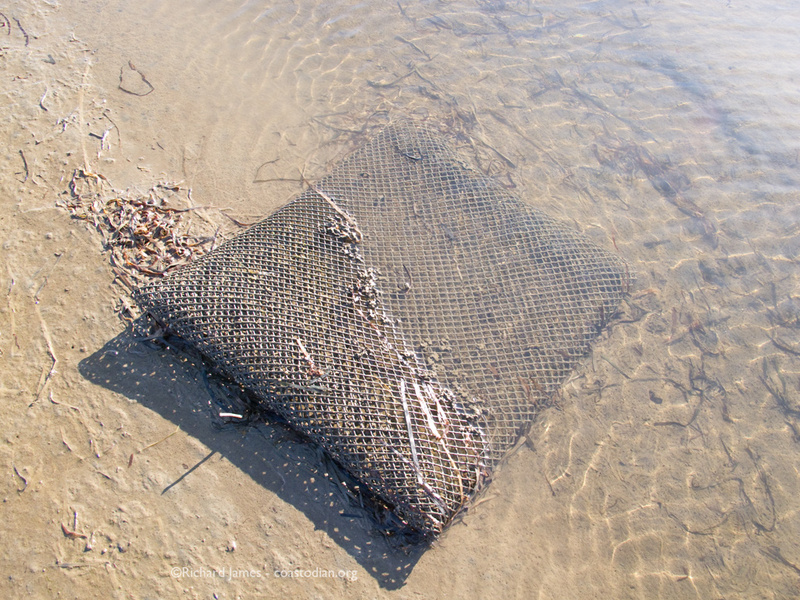 They care deeply about the bay and want to work with me to see how to have regular, thorough clean-ups of the feral plastic their operations introduce into the global ecosystem. 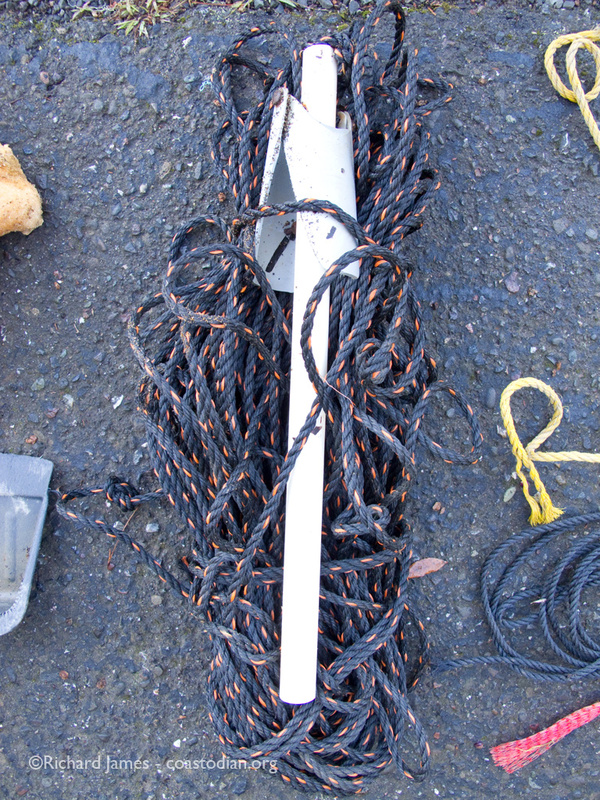 They continue to reach out to fellow oysterers for help in recovering the rubbish that regularly is loosed on the water and land by wind and wave. 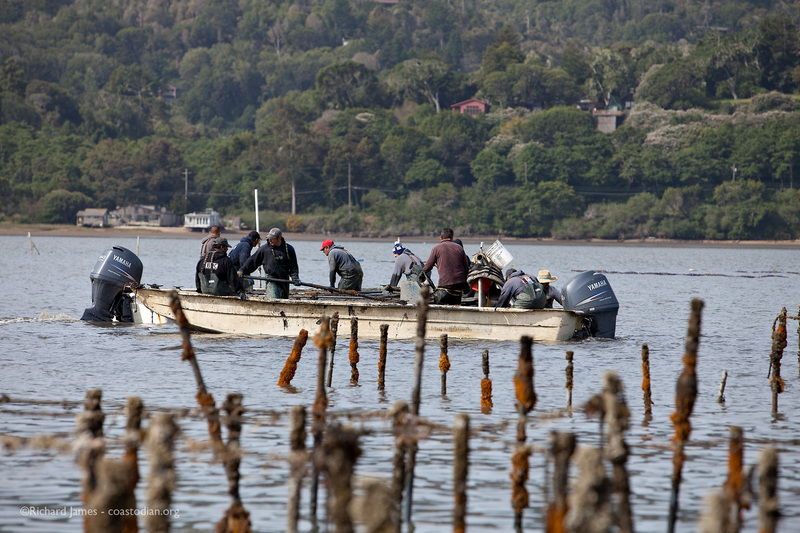 Let’s hope with increased public scrutiny, all growers participate in protecting the Bay from human activity from now on. 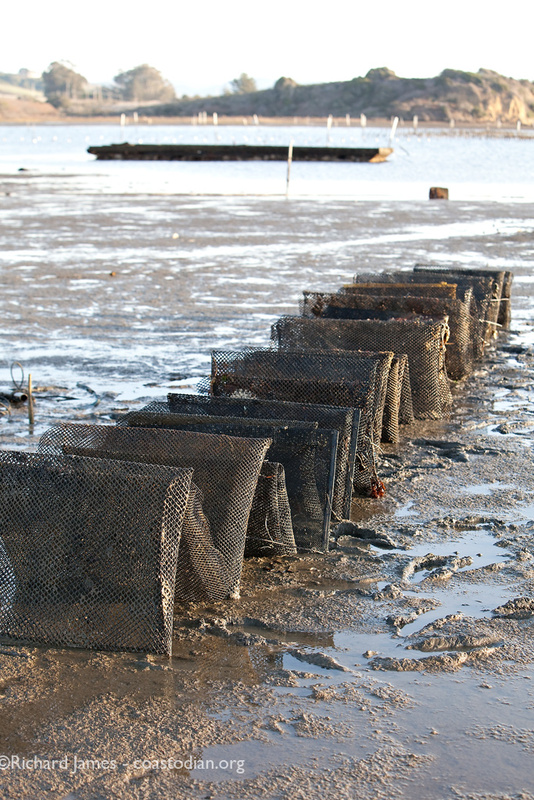 Below are images from efforts on 14 and 15 December. 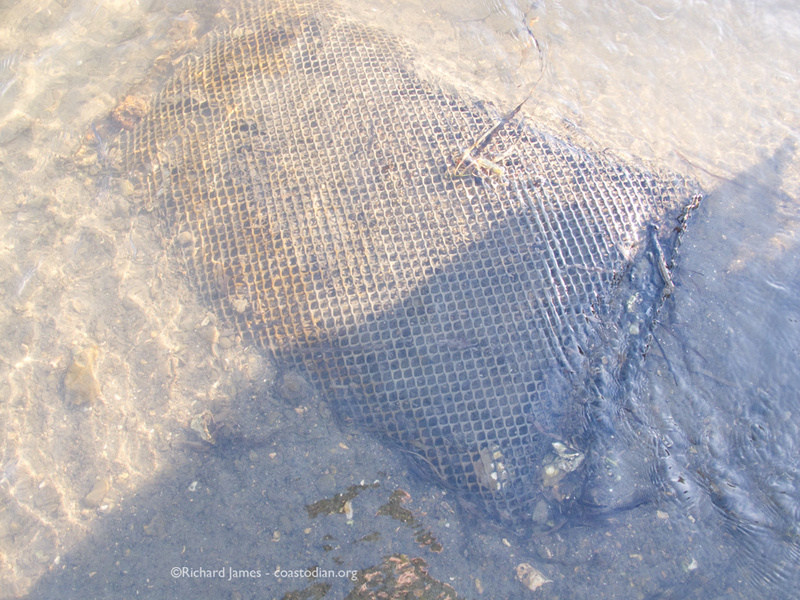 Five weeks ago I recovered 24 bags along with the usual plastic bits, bottles and foam. 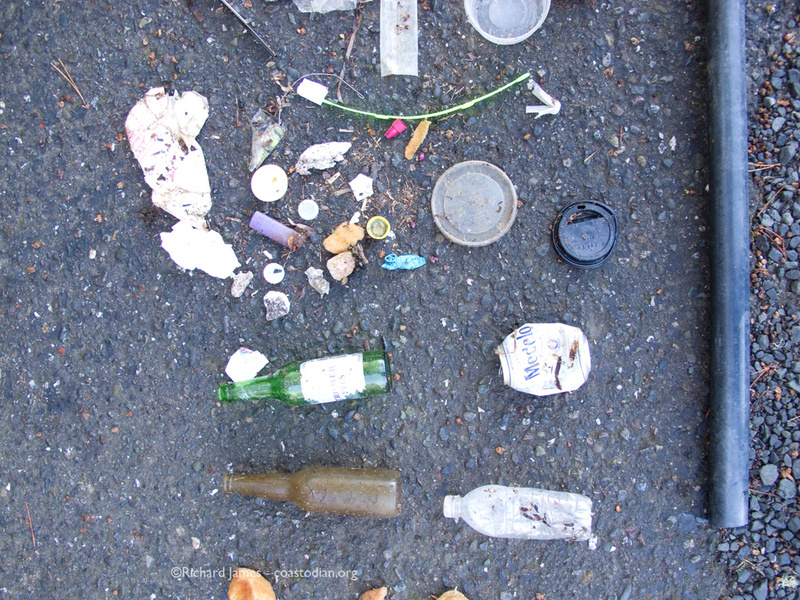 Last week in the same area I collected 29 bags. Does anyone see a trend here? I’m told these bags cost 2 bucks a piece. 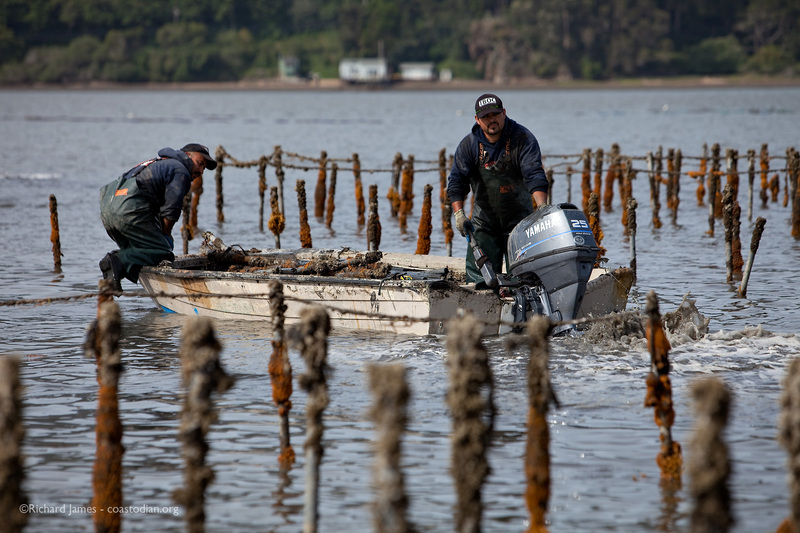 Must be good money in oysters to be throwing away so much cash. 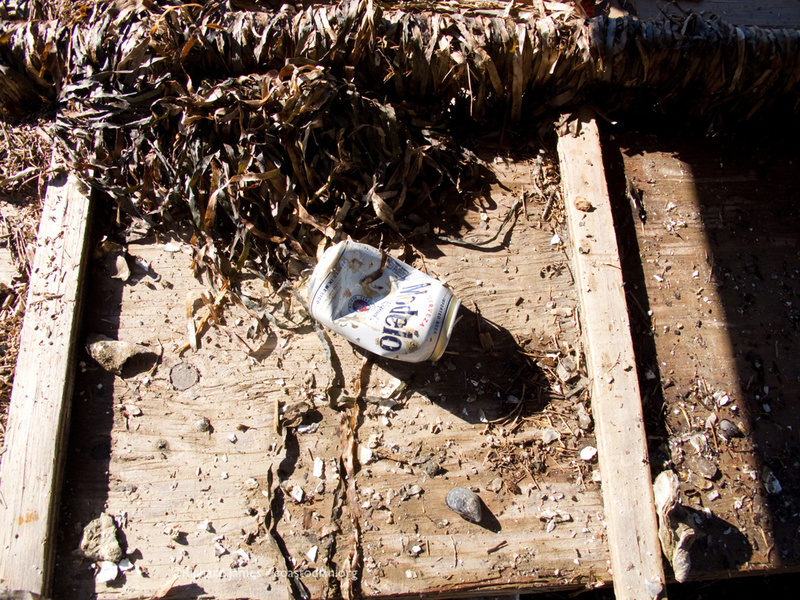 One of a few “work-sites” on The Bay where materials and rubbish are regularly left to the winds and waves. 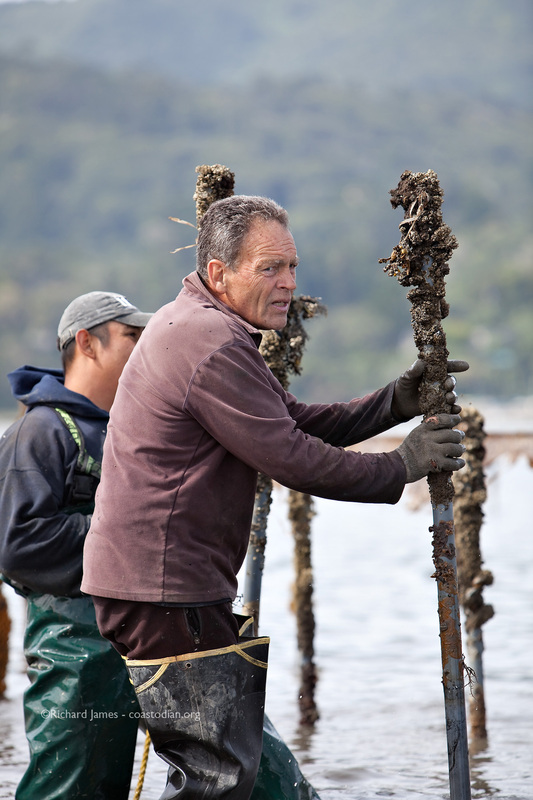 A favorite libation of the oyster worker. 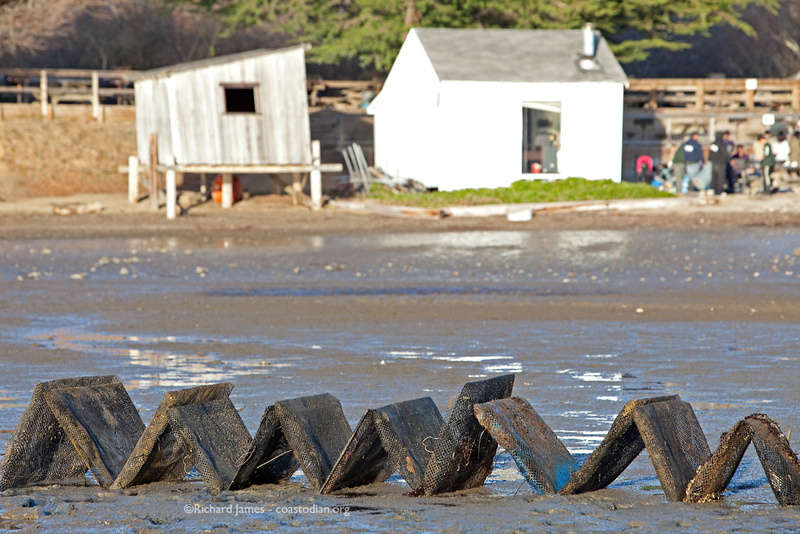 I find them all over Tomales Bay. 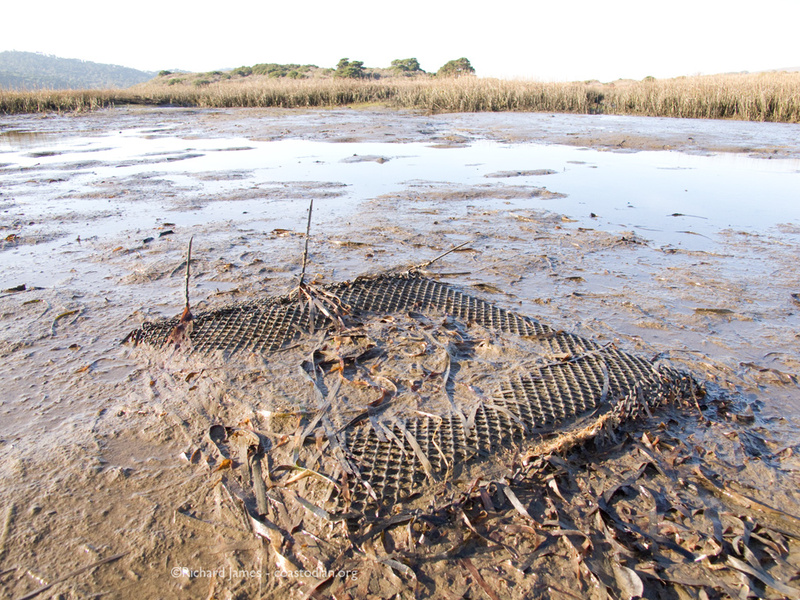 Are these companies aware that their name is attached to oyster farm debris littering Tomales Bay? 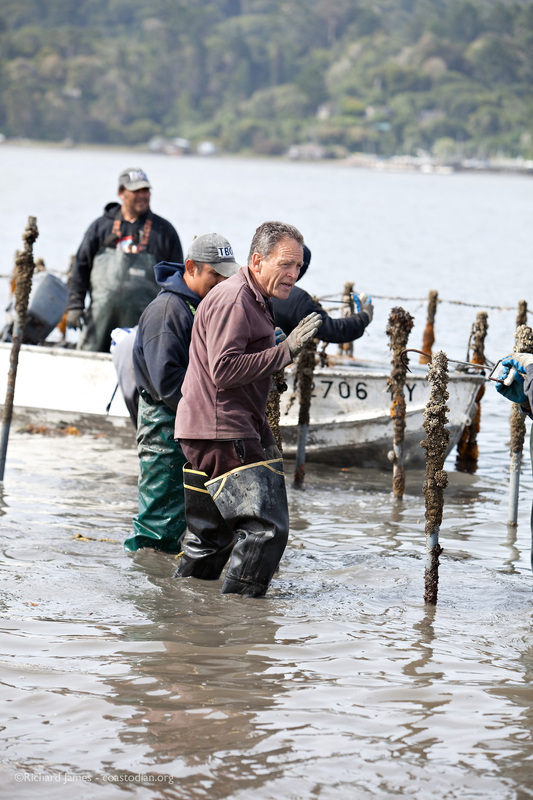 More tags from those Washington oysters – Nisqually Tribe Shellfish Farm, Tom Farmer Oyster Company, Taylor Shellfish Farms, Gold Coast Oyster LLC, Northwest Shellfish Company, Schreiber Shellfish Inc.
Boat loaded down with several hours work cleaning up after local oyster farmers. 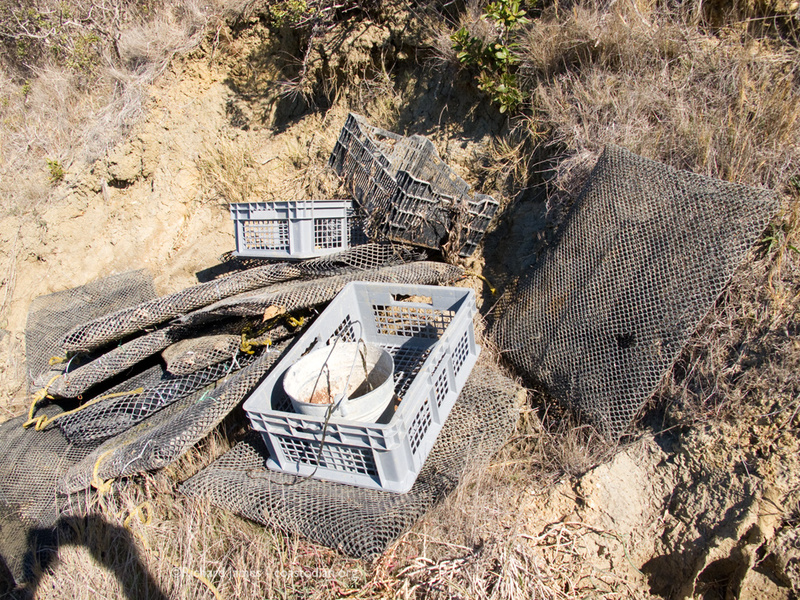 Feral plastic unloaded and turned into a monument to oyster profits over a clean environment. 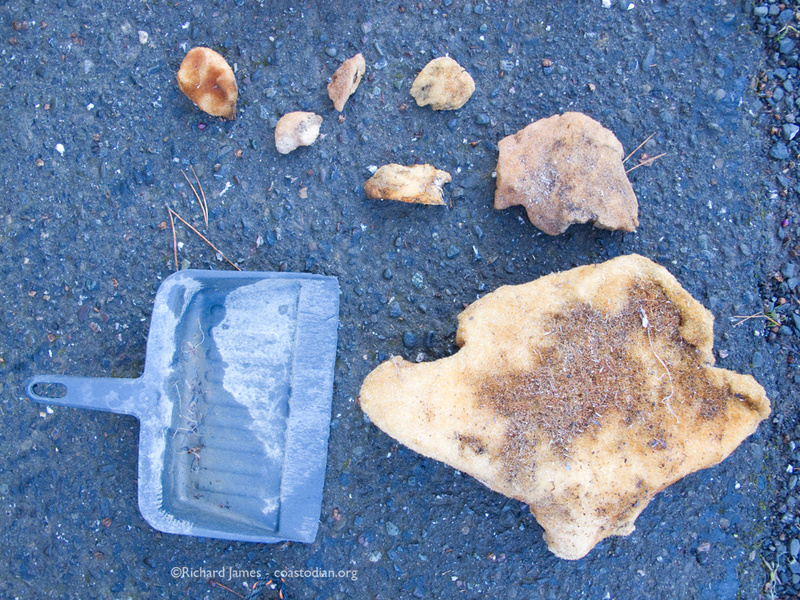 Now that the hard work of finding, pulling out of the mud and returning to the source has been done for them, I hope they at least had the decency to come out and get their trash. 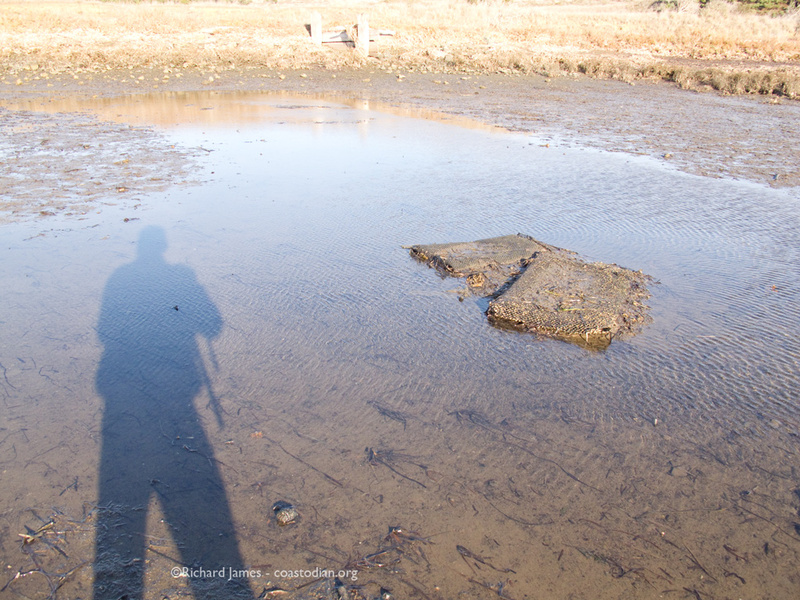 The low tide prevented me from getting in closer to shore. 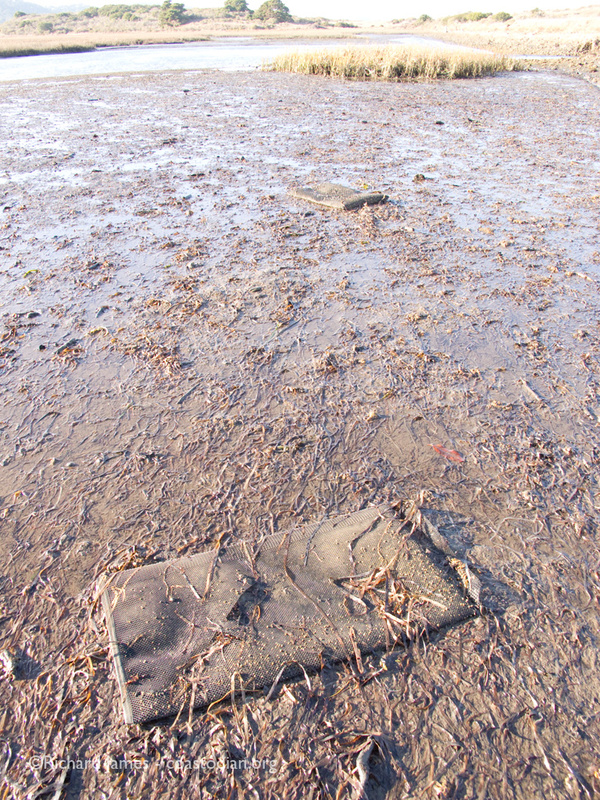 Dozens of bags buried in the mud, abandoned for so long they have become substrate for the ecosystem. 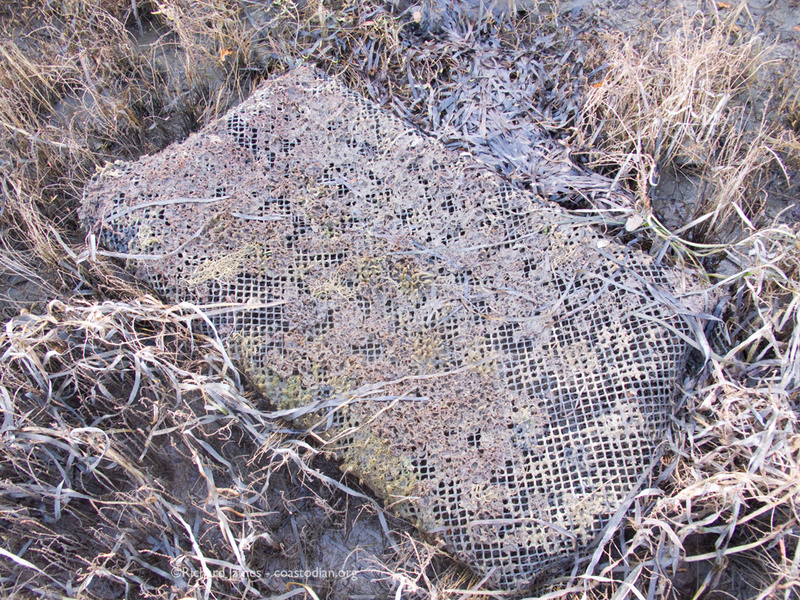 Polyethylene is not a sustainable substrate. 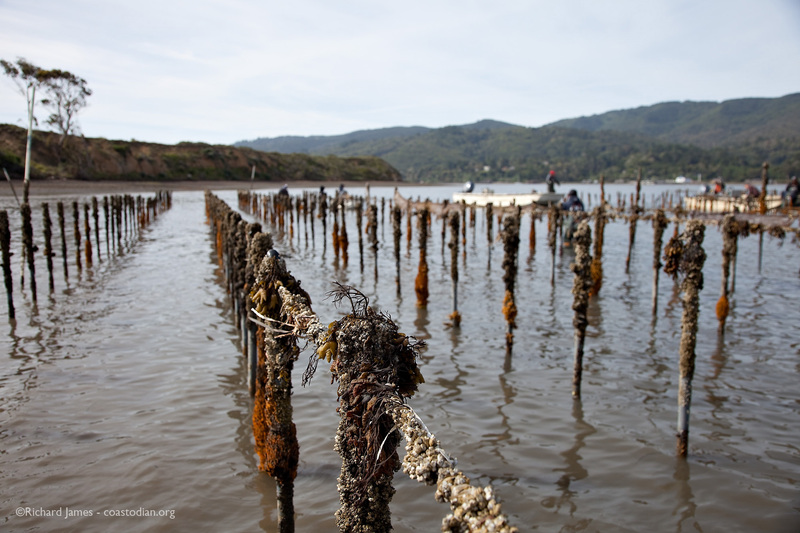 oyster bags, plastic ropes – tools of the oyster trade I find all over the beaches of West Marin. 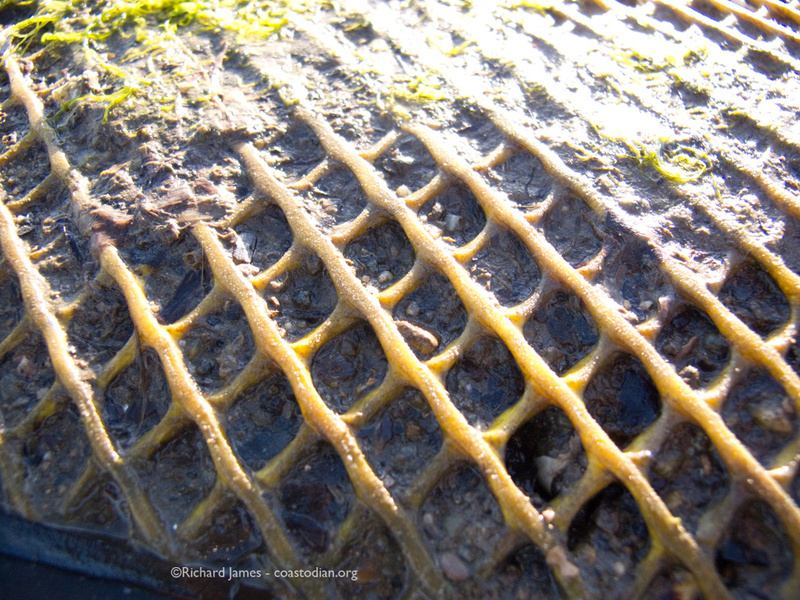 The same material found in the guts of dead whales, dead turtles and dead birds. 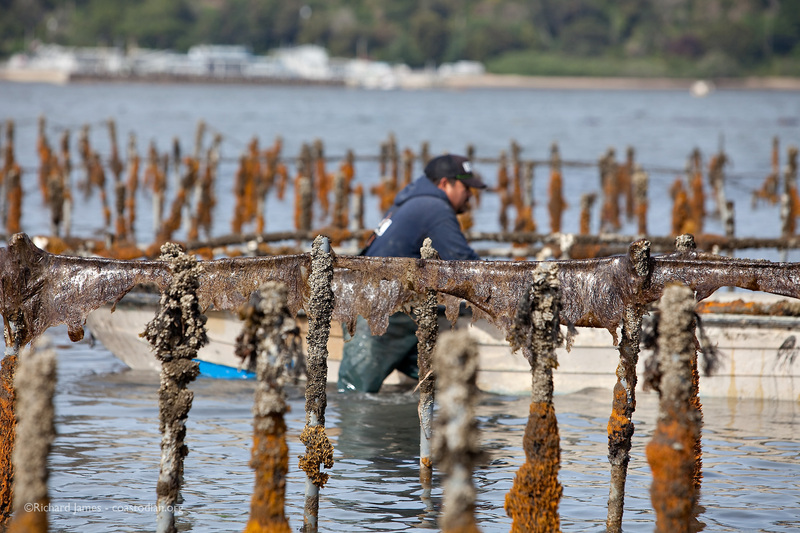 This foam provides buoyancy for the work platforms used by oyster farmers. I find this stuff all over the place. Some pieces too large to fit in my car, so they are strapped on top. 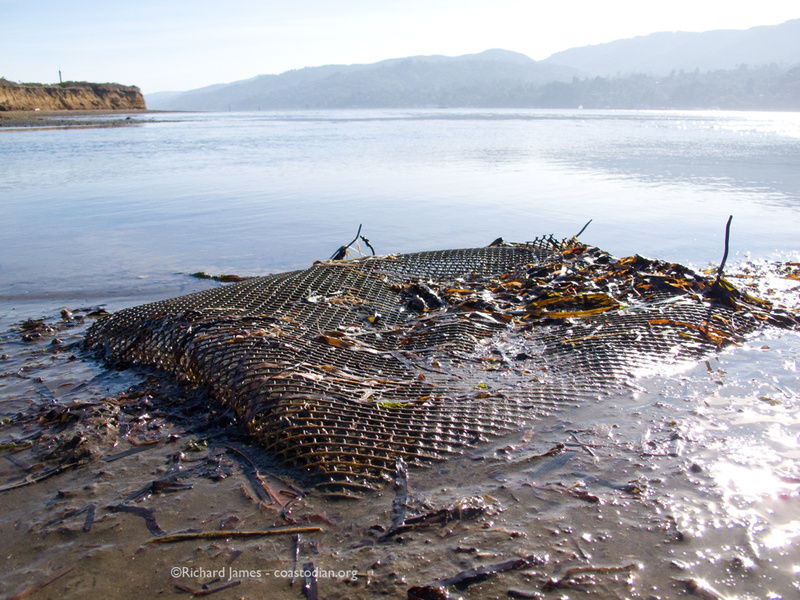 I’ve been picking this up from the shores of Drakes Estero for years. 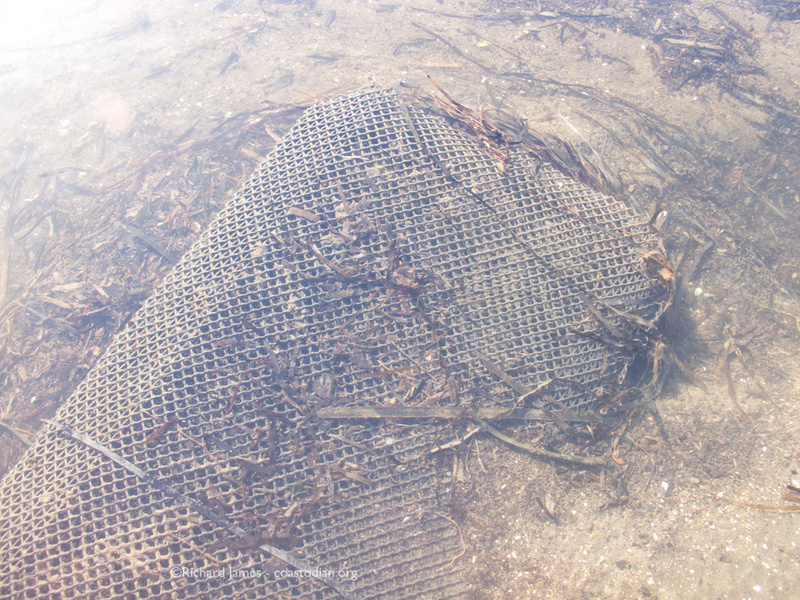 Thankfully that operation will soon close and the source of this toxic blight in those waters will go away. 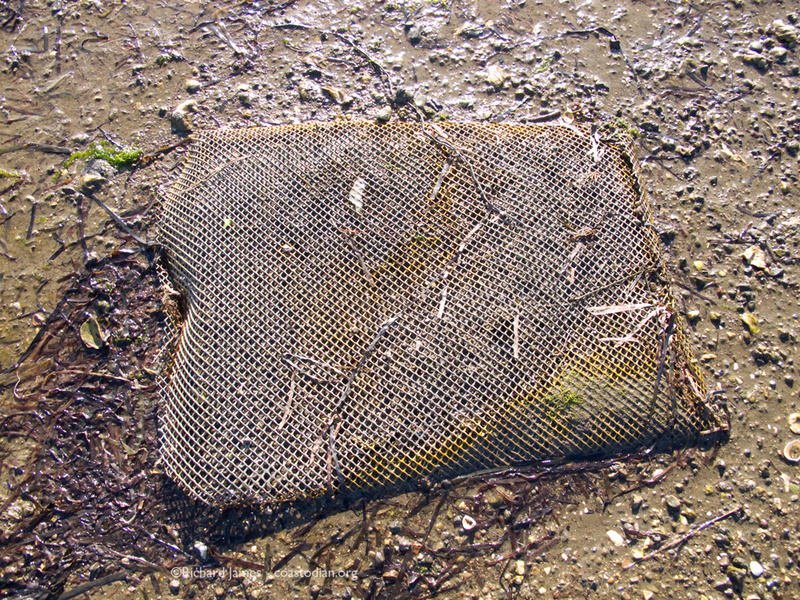 Ironic that I regularly find dust pans on the beach. Brooms and brushes too. 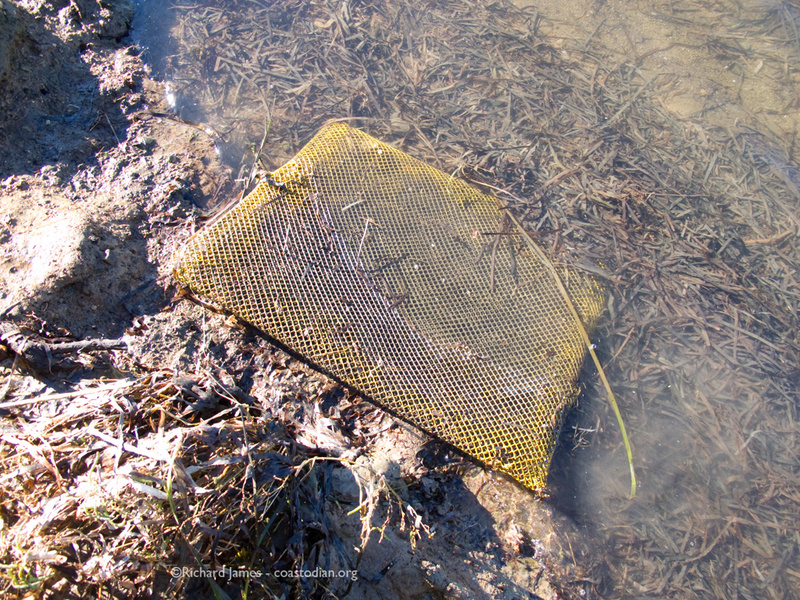 Grow-out bag covered with California horn snails CORRECTION: Japanese Mud Snails, brought in with non-native oysters long ago. 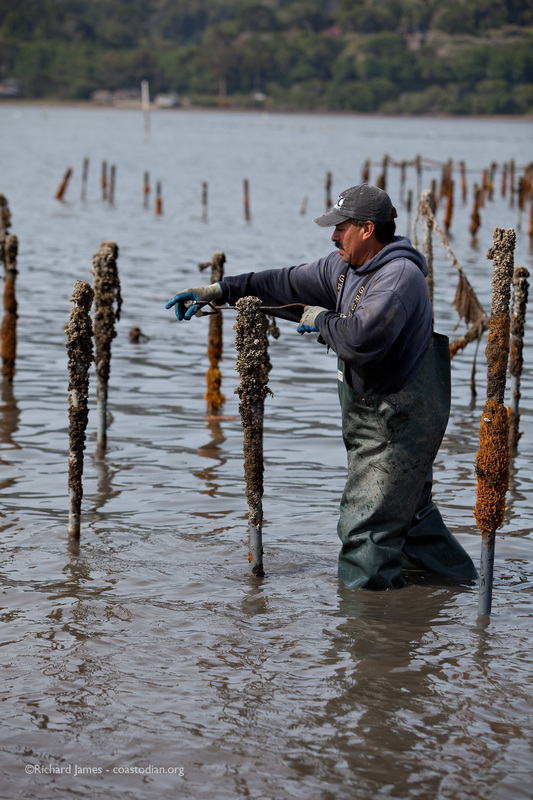 Yet more damage done to California environmnet by shellfish growers. 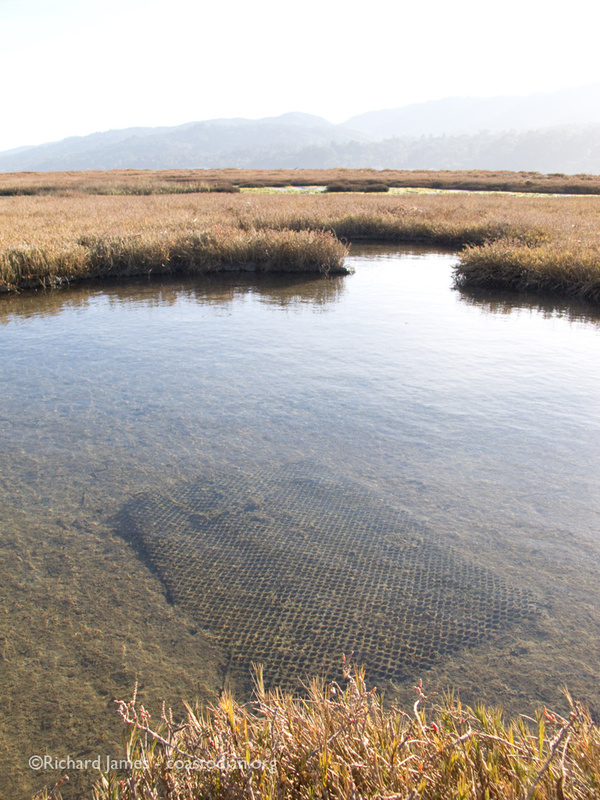 They eat detritus and benthic diatoms. 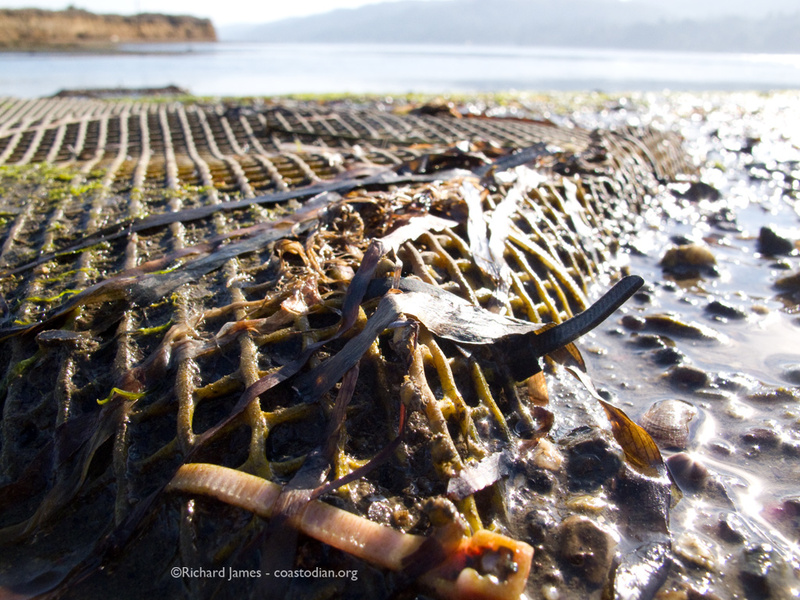 Their preferred diet is benthic diatoms, not the detritus you see here. 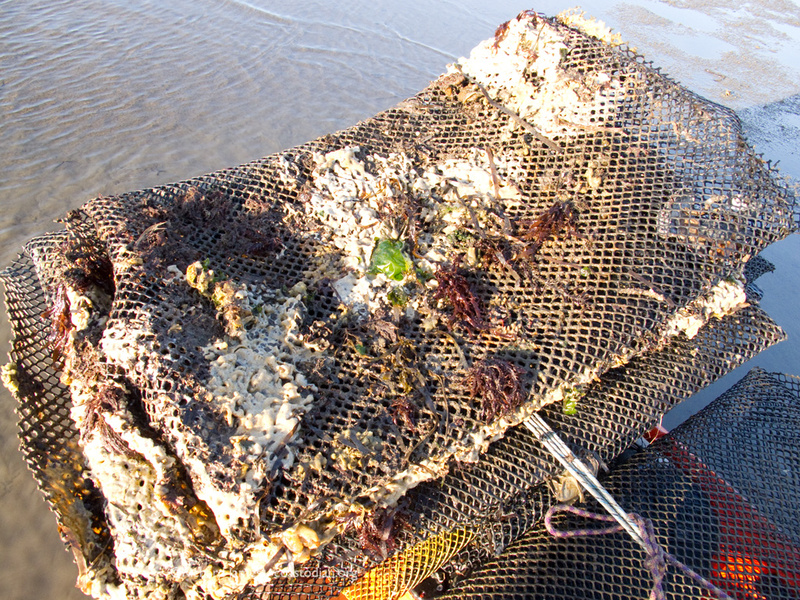 No oysters in this long abandoned grow-out bag. Just sand and mud.